My husband isn’t a fan of Christmas decorations (gasp! – I know!!). He said his mom overloaded him with them when he was young. We were together for over 10 years before he let me bring a tree in the house. (The things you do for love????) So finally, when I did get a tree, he went shopping with me to get the ornaments. He didn’t want anything cheesy or over-Christmas-y. He and I are both nature lovers and used to go hiking and camping and swimming in natural springs almost every weekend. So, we were able to find nature-inspired ornaments like pine cones and apples, etc. But overtime, the designer in me started to get really bored. So, last year, I found a bunch of adorable woodland animal ornaments at Target. They were all on sale thank goodness because I cleaned them out. I was able to continue to use the apples and stuff because it went with the woodland theme. The little woodland animals eat the fruit! The tree is also red, gold and white theme. Which is so traditional for me. But it’s cozy and sweet and my son Kai loves it. 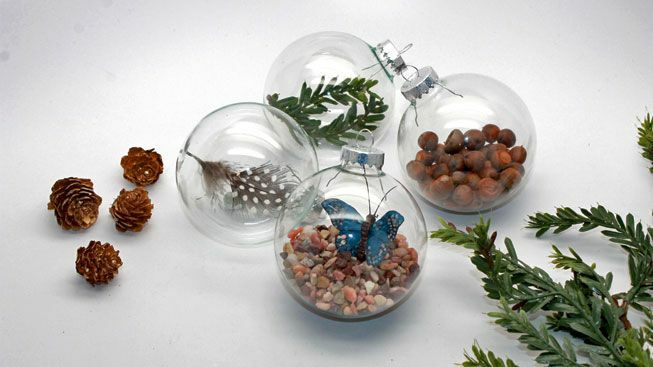 So, I thought I’d keep with my nature-inpsired Christmas and make some nature-filled ornaments for Mother Nature Network. Click here for a complete how-to. What’s awesome about these is that you can pick up everything you need on a nature hike with your family. I love it!! !